This crunchy salad tastes great. 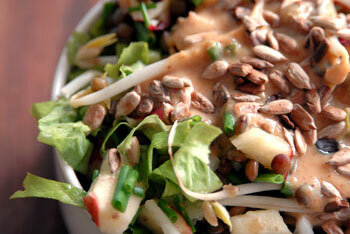 The peanut butter dressing is such a smooth compliment to the crunchy ingredients. Cook the lentils in the vegetable bouillon until al dente. When cooked, drain off the liquid and put the lentils in the refrigerator to cool. Wash the bean sprouts and the lettuce and shred the lettuce. Slice the apple into bite sized pieces. Mix all the vegetables together with the lentils. Make the dressing with the remaining ingredients. Lightly drizzle the dressing over the salad and toss well to mix. 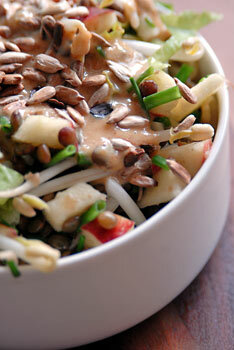 Serve the salad garnished with the toasted sunflower seeds. Posted by Chris Walker on July 10, 2007 in Apple, Ingredients, Lentils, Meals, Salads.